He Laid Out Old Newspapers On The Grass. Seemed Crazy, But It’s Brilliant For Gardening! If you are a person who loves nature, you should try your best to be friendly to Earth. You shouldn’t litter, take public transit as much as you can, and recycle as often as possible. Always try to improve nature and find better ways to do so. Honestly, it can be really tough. To lead an organic life is extremely expensive, and life passes so quickly, we often make irresponsible decisions. You should learn eco-friendly tricks, and today we present you one. Did you know that by hanging on to some old newspapers, you can enhance your garden, but improve the Earth as well? This incredible tutorial from the award-winning gardener Kevin Jacobs, can teach you how to save nature and a few buck as well. If you happen to have a plot of land that’s perfect for gardening, but it’s been invaded by weeds, don’t buy chemical sprays right away. 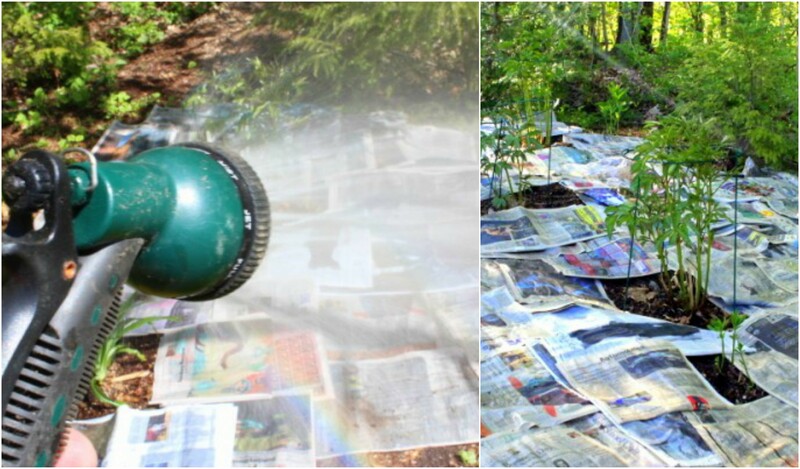 If you only have some old newspaper, you can totally transform your garden. You nature and your wallet will be grateful. Start off by watering your garden. Then, lay down the pages of your paper into the weeds and around the plants. After you have covered the chosen ground completely, the process of watering can be started. Take your hose and douse it. Don’t worry if the water is unable to penetrate the paper. It will find a way to go through to the soil bellow. After you see that the papers are well soaked, cover them with a 3-inch layer of mulch. Shredded leaves or wood chips are a good choice. The newspaper feeds the soil and starves out the weeds. It won’t be long until your paper starts decompose- this makes worms happy. Worms are very important for building healthy soil, meaning better veggies. If you don’t have enough newspaper, cardboard is fine as well. Do you agree that this is an awesome alternative instead of using chemicals? The Earth will be beyond grateful! What does the lead do to your fruits, veggies and the earth, it’s a good idea,but I want to know I’m not still putting chemicals in the ground!? Perhaps that’s why the suggest using “OLD” newspapers?